Start your bicycle tour in Salzburg with the panorama of the Alps at your back, cycling through the spectacular Salzkammergut, to the great European city of Linz, and then up into the hills to medieval Cesky Krumlov. From there it’s on to Prague, city of a thousand spires. On this trip you will bike through country that epitomizes what most people think of when they hear the word “Europe”: small towns watched over by ancient castles, deep green forests and rolling hills, little villages with church steeples dotting the countryside. Enjoy an original Budweiser in Ceske Budejovice, then go with the flow of the Vltava River until you reach magnificent Prague. This features a superb combination of landscapes, chateaux, and three fabulous cities. 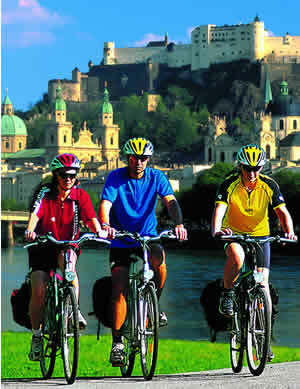 Send us an email for custom, guided bicycle tour Salzburg - Prague in different dates.